Woohoo! Not only did I get my Christmas Patience Corner quilt binding done but the #2 Alabama Crimson Tide just beat the #3 Georgia Bulldogs to win the SEC Championship and the opportunity to face Notre Dame for the BCS Championship for the 2nd year in a row. Roll Tide. The quilt measures 83.5 x 95 and really is a perfect fit for my bed with that oversized pillow top mattress. Thanks again to those that gave me fabrics to include in it and especially to Norma for quilting it. I am thrilled! Today was the Christmas parade in our little corner of NE Central Alabama. I took the camera with me today to get some pictures. You can see that it was a gorgeous day----hit close to 70 so there were quite a few people out. This first one shows some of the elementary school kids dressed as Christmas packages. Hauling a gazebo down the street to promote some builder---couldn't believe it! Candy to toss out to the kids in the back. The Shrine group always look like they are having a great time with their little go karts. 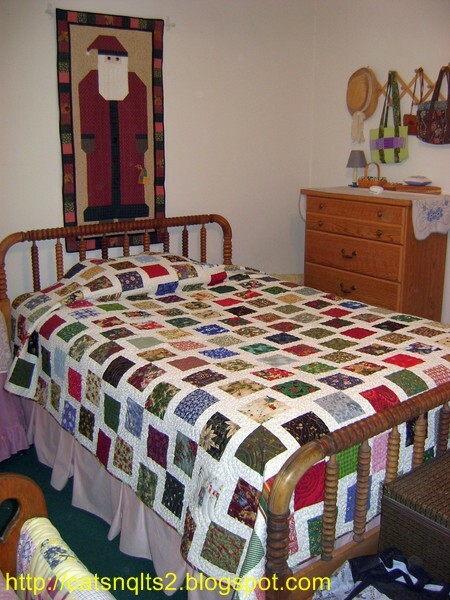 Your Patience Corners quilt looks great on the bed. The Santa quilt on the wall and the Christmas quilt on the bed should ensure that nothing but sugarplums will be dancing in your head! It was a pleasure quilting your quilt--excellent piecing as always! I love your patience corners quilt. Congratuslations on a beautiful finish! I hope to make another one of the patience corners quilts, but similiar to your this time. With a bone/ barely off white background with pastel calicos for the bigger squares. Fabrics allready pulled from the stash, just need to start cutting it.